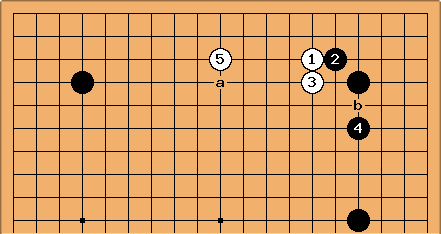 This is an introductory lesson in attacking aimed at beginners 26 kyu to 18 kyu. Let's say you're black, and you want to attack the white stone there. The first thing that most people think of when they want to attack is contact. Real-life fights involve contact, right? Hitting, punching, kicking, etc.? So, why isn't or a-d good? A better plan is here or at a. Why? Because it threatens to take away White's base on the side. Without a base, White will have a harder time making eyes. 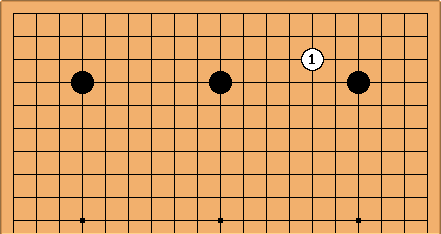 White will probably make a base at or near b (or run into the centre by playing at or near c in some circumstances), but now notice the key thing: remains a useful stone after white defends (it works with Black's corner stone, making a framework on the side). Black gained something in the process of attacking. Now, let's look at an exception. 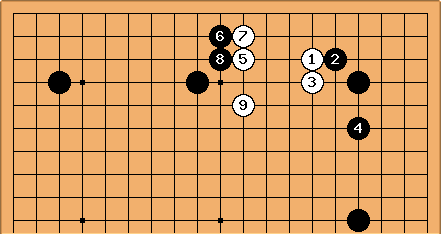 Now black plays , a good move. But wait! It's a contact move, and we just said not to play those when attacking! On the top, white is heavy. There isn't space for white to make a cozy base. On the bottom, white is strong. 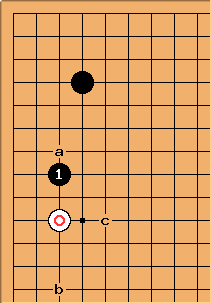 Black played to try and save , but now white will play a or b, making a big base while attacking Black's corner at the same time. In neither diagram was an attacking move. On top, makes white heavy, and it is part of an effective attack, but is the attacking stone. 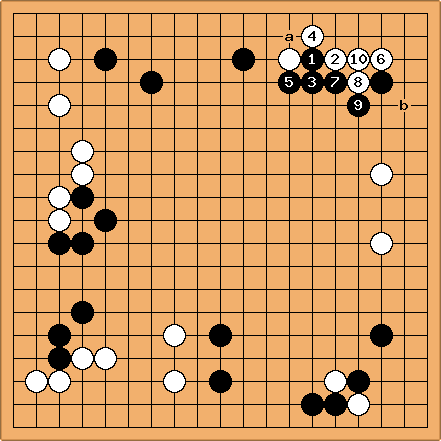 On the bottom, is a very bad move; White will become strong and Black gains little in exchange. 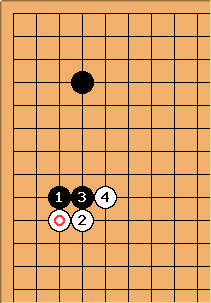 To make an effective attack, you must threaten the base or eyeshape of your opponent's stone. Always attack to gain something else. 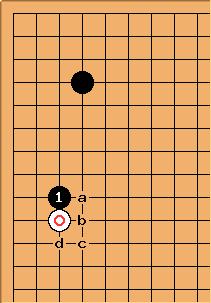 Four Basic Shapes - part of a book by chinese pro Fan Hui, having an thorough example on how to attack (example #1). 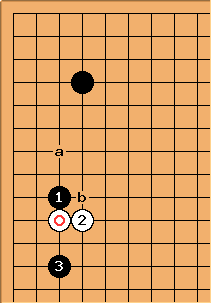 Here are two common beginner continuations, both bad for black. 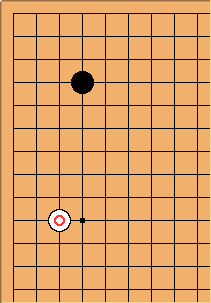 See hane at the head of two stones. Note that and both have nearby supporting stones! 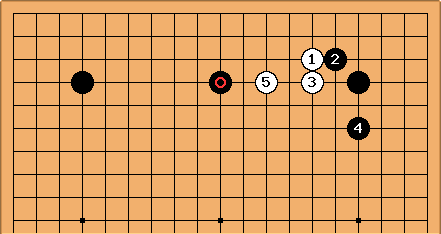 As in the san-ren-sei example above, is preventing white from making a base in that direction. This full-board joseki is a case where the attack is good, even though white can make a nice extension. 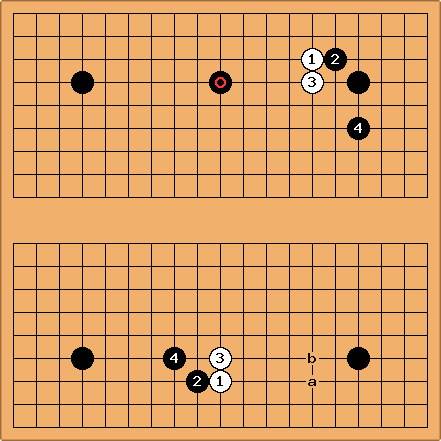 The reason is that, although white is able to make a living group easily, black gains a lot at the top left. Contributors: LukeNine45, Bill, Unkx80, xela and anonymous.